‘THE centre cannot hold, and things are falling apart’ is typically what is transpiring in Zambia’s largest opposition political party, the UPND. It has become apparent that the once formidable opposition party appears to be fast losing its cohesion in the aftermath of the general elections and subsequent failed election petition. The unfolding events that have characterised the party in the recent days point to a very gloomy picture ahead for the party. The rate at which senior party officials are ditching the party can only suggest that something has seriously gone amiss. It started with the UPND party deputy spokesperson, Edwin Lifwekelo, immediately it became clear that the party had lost the August general elections and that petitioning the re-election of President Edgar Lungu was a sheer a waste of time. In quick succession, UPND presidential spokesperson, Edward Mumbi and vice-president for politics, Dr Canisius Banda resigned on Tuesday and Wednesday this week. What has gone wrong? Who is the cause of this dissipation? What is wrong with a party member calling for introspection, let alone for a national convention? We reiterate what we have said before. The problems that the UPND is currently facing are expected. They are self-created. Objectively speaking, the party leader is under siege by a clique of individuals with ulterior motives. The indigenous UPND party members know this and the sooner they do something about it the better. 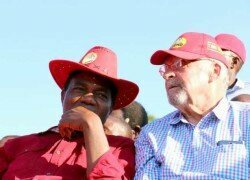 The clique of individuals who joined the party on the pretext of offering support to the party have greatly contributed to what is currently happening to UPND. Of course, there was nothing wrong with rendering their support particularly that the UPND struggled to shed off the tribal tag it had been associated with, but this has not worked as planned. The individuals who joined the party ranks brought more harm than good to the party. When we talked about the disgruntled cartel which had left the Patriotic Front (PF) after losing to President Lungu in the 2015 presidential election and sought refuge in the UPND to help in denting the good image of the party, our observation was dismissed with contempt, we were insulted and threatened with closure should the UPND have formed government after the August general elections. Now the writing is on the wall that the majority of the top party leadership is not happy with the manner in which the party has been managed. When the UPND vice-president for administration Geoffrey Bwalya Mwamba spewed invectives on innocent individuals for merely expressing divergent views, the party failed to condemn such bad conduct. We stated it and say it again. It is this idiosyncrasy that has painted the party black and that is why some party members who do not agree with what is going on have opted to leave. As a party, the UPND was not originally known for violence in the manner and degree that the country witnessed during the campaign period leading to last month’s polls. Similarly, it is the same characters who have hijacked the party who imported and instigated unparalled violent behaviour among the party cadres. The UPND, we believe has not only become autocratic but also dictatorial, hence every party member, regardless of position, who chooses to exercise their democratic and constitutional rights is victimised to the extent of their lives being threatened. What has happened to the vice-president for politics, Dr Canisius Banda has opened a Pandora’s Box. Many who are discontented with the status quo are surely going to follow suit. The clandestine manoeuvres to stamp out whoever puts across some progressive ideas to align the party to democratic values and practices will steadily erode the party’s popularity. Holding of intra-party elections is systematic with democracy the world over and is, in fact, in line with our Republican Constitution. The UPND top leadership has clothed itself with an arrogance in which few individuals think themselves to be higher in status than others, in other words gods to be worshipped.